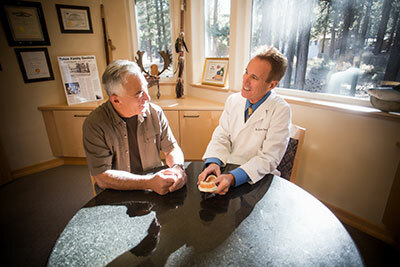 Dental Implants – Tahoe Family Dentists - Providing excellence in dentistry in South Lake Tahoe. If you have a tooth that requires extraction, replacing it with an implant will save the look and function of your smile. Do you have a tooth that requires extraction due to excessive decay or damage? 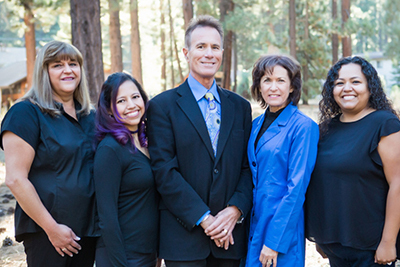 At our dental office in South Lake Tahoe, we focus on saving teeth whenever possible – but sometimes an extraction is the only option. In such cases, a dental implant can replace the lost tooth with a perfect replica, saving your smile. A dental implant is a complete replacement tooth, designed to last your lifetime. The implant itself is a small titanium post that replaces the roots of the missing tooth. The post is inserted into your jawbone in the place that the missing tooth used to be rooted. When the bone has grown around the post, a porcelain crown that looks just like your other teeth is placed on top of the implant to complete the restoration. Dentures can also be used to support a multi-tooth bridge, or even complete dentures if many or all of your teeth are missing. While dental implants have a slightly higher initial cost that dentures or bridgework, they are the most cost-effective option long term, since they can often last the rest of your life (they do not decay). They will also help guard against additional tooth loss, since they prevent bone loss in the jaw at the site of the lost tooth. The first step to getting a dental implant is a consultation. After evaluating the condition of your teeth, gyms, and existing bone, the dentist can help determine if you are a good candidate for a dental implant. There will be a series of appointments depending on several factors, including how much prep work needs to be done to get your mouth to accept the implant, the creation and placement of the implant, healing time, and the customization and installation of your crown, bridgework, or dentures. Once your implant is placed, you can help it last the rest of your life by maintaining a good oral health and dental care regimen; brushing and flossing daily, and keeping your dental appointments for cleanings, exams, and periodontal therapy if indicated.